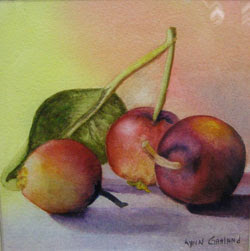 This beautiful little painting was done by one of my Friday morning drop-in students, Lynn. She created this piece at home and brought it in to show the rest of the class. I thought it was lovely! The colors are rich and the mood is very sweet. Yes, this is a watercolor! Great job, Lynn.